Animalia - El Diccionario Visual - Copyright © 2005-2016 - Todos los derechos reservados. 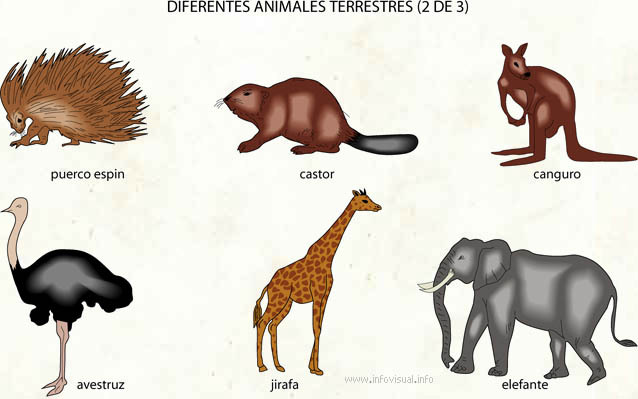 [img]https://infovisual.info//storage/app/media/02/img_es/079 Diferentes animales terrestres.jpg[/img] [url=https://infovisual.info/index.php/es][/url] - [url=http://www.infovisual.info/] El Diccionario Visual[/url] - Copyright © 2005-2016 - Todos los derechos reservados. Diversos animales de la tierra (Animalia): animales que viven en la tierra. Puerco espin: mamífero nocturno con púas corneas. Castor: mamífero roedor que vive en América del Norte y Europa. Canguro: marsupial de Australia que se desplaza a saltos. Avestruz: gran ave que no puede volar, pero se desplaza rápidamente con sus patas muy largas. Jirafa: mamífero de Africa con cuello muy largo. Elefante: gran mamífero ungulado de Africa o de Asia. Beavers are two primarily nocturnal, semi-aquatic species of rodent, one native to North America and one to Europe. They are known for building dams, canals, and lodges (homes). They are the second-largest rodent in the world (after the capybara). Their colonies create one or more dams to provide still, deep water to protect against predators, and to float food and building material. The North American population was 60-400 million, but as of 1988, 6-12 million, due to being hunted for fur, for their glands used as medicine and perfume, and because their harvesting of trees and flooding of waterways may interfere with other land uses. Beavers are known for their natural trait of building dams in rivers and streams, and building their homes (known as beaver lodges) in the resulting pond. Beavers also build canals to float build materials that are difficult to haul over land. They use powerful front teeth to cut trees and plants that they use for building and for food. They are known for their "danger signal": when startled or frightened, a swimming beaver will rapidly dive while forcefully slapping the water with its broad tail. This creates a loud "slap", audible over large distances above and below water. This noise serves as a warning to beavers in the area. Once a beaver has made this danger signal, nearby beavers dive and may not reemerge for some time. Beavers are slow on land, but good swimmers that can stay under water for as long as 15 minutes. (Wilson, 1971) Rarely, a frightened beaver attacks a human. Beavers do not hybernate, but store sticks and logs underwater to feed on during the winter. Fossil remains of beavers are found in the peat and other superficial deposits of England and the continent of Europe; while in the Pleistocene formations of England and Siberia occur remains of a giant extinct beaver, Trogontherium cuvieri, representing a genus by itself. Beavers have webbed hind-feet, and a broad, scaly tail. They have poor eyesight, but keen senses of hearing, smell, and touch. Beavers continue to grow throughout life. Adult specimens weighing over 25 kg (55 lb) are not uncommon. Females are as large as or larger than males of the same age, which is uncommon among mammals. They are the only extant members of the family Castoridae, which contains a single genus, Castor. Genetic research has shown the European and North American beaver populations to be distinct species and that hybridization is unlikely. Beavers are closely related to squirrels (Sciuridae), agreeing in certain structural peculiarities of the lower jaw and skull. In the Sciuridae the two main bones (tibia and fibula) of the lower half of the leg are quite separate, the tail is round and hairy, and the habitats are arboreal and terrestrial. In the beavers or Castoridae these bones are in close contact at their lower ends, the tail is depressed, expanded and scaly, and their habitats are aquatic. European and American beavers grow to about 2 ft (0.61 m) long (plus 10 in (250 mm) of tail). They are essentially aquatic in their habits, never traveling by land unless driven by necessity. They are crepuscular rather than nocturnal, which means they are active at dawn and dusk, and subsist chiefly on bark and twigs or the roots of water plants. They have been known to eat grasses on the banks of rivers and streams. The European Beaver (Castor fiber) was hunted almost to extinction in Europe, both for fur and for castoreum, a secretion of its scent gland believed to have medicinal properties. However, the beaver is now being re-introduced throughout Europe. Several thousand live on the Elbe, the Rhone and in parts of Scandinavia. A thriving community lives in northeast Poland, and the European Beaver also returned to the Morava River banks in Slovakia and the Czech Republic. They have been reintroduced in Scotland, Bavaria, Austria, The Netherlands and Serbia (Zasavica bog) and are spreading to new locations. The beaver became extinct in Great Britain in the sixteenth century: Giraldus Cambrensis reported in 1188 (Itinerarium ii.iii) that it was to be found only in the Teifi in Wales and in one river in Scotland, though his observations are clearly first hand. In October 2005, six European beavers were reintroduced to Britain in Lower Mill Estate in Gloucestershire; in July 2007 a colony of four European beavers was established at Martin Mere in Lancashire, and there are plans for re-introductions in Scotland and Wales. The American Beaver (Castor canadensis), also called the Canadian Beaver (which is also the name of a subspecies), or simply Beaver in North America, is native to Canada, much of the United States and parts of northern Mexico. The chief feature distinguishing C. canadensis from C. fiber is the form of the nasal bones of the skull. This species was introduced to the Argentine and Chilean Tierra del Fuego, as well as Finland, France, Poland and Russia. The American beaver's preferred food is the water-lily (Nuphar luteum), which bears a resemblance to a cabbage-stalk, and grows at the bottom of lakes and rivers. Beavers also gnaw the bark of birch, poplar, and willow trees; but during the summer a more varied herbage, with the addition of berries, is consumed. These animals are often trapped for their fur. During the early 19th century, trapping eliminated this animal from large portions of its original range. However, through trap and transfer and habitat conservation it made a nearly complete recovery by the 1940s. Beaver furs were used to make clothing and top-hats. Much of the early exploration of North America was driven by the quest for this animal's fur. Native peoples and early settlers also ate this animal's meat. The current beaver population has been estimated to be 10 to 15 million; one estimate claims that there may at one time have been as many as 90 million. The habitat of the beaver is the riparian zone, inclusive of stream bed. The actions of beavers for hundreds of thousands of years in the Northern Hemisphere have kept these watery systems healthy and in good repair, although a human observing all the downed trees might think that the beavers were doing just the opposite. The beaver works as a keystone species in an ecosystem by creating wetlands that are used by many other species. Next to humans, no other extant animal appears to do more to shape its landscape. Beavers fell trees for several reasons. They fell large mature trees, usually in strategic locations, to form the basis of a dam. They fell small trees, especially young second growth trees, for food. Ponds created by beavers also kill trees by drowning. A beaver shapes a dam according to the strength of the water's current. Relatively still water encourages dams that are almost straight; while dams in stronger currents are curved, bowed toward upstream. The beavers use driftwood, green willows, birch and poplars; and they mix in mud and stones that contribute to the dam's strength. Beavers are known to build very large dams. The largest known was discovered by satellite imagery in Northern Alberta in 2007, approximately 2,790 ft (850 m) long , beating the previous record holder found near Three Forks, Montana, at 2,140 ft (650 m) long, 14 ft (4.3 m) high, and 23 ft (7.0 m) thick at the base. When objectionable beaver flooding occurs, modern water level control devices can be installed for a cost-effective and environmentally sound solution. Unwanted damage to trees can be prevented by wrapping chicken wire or sheet metal around the base of trees. In places," writes Hearne, which have been long frequented by beavers undisturbed, their dams, by frequent repairing, become a solid bank, capable of resisting a great force both of ice and water; and as the willow, poplar and birch generally take root and shoot up, they by degrees form a kind of regular planted hedge, which I have seen in some places so tall that birds have built their nests among the branches. It is primarily prolonged exposure to the sound of water in motion that stimulates the beavers to build. However, studies involving beaver habitual activities have indicated that beavers may respond to an array of stimuli, not just the sound of running water (such as seeing water movement). In two experiments Wilson (1971) and Richard (1967, 1980) demonstrate that, although beavers will pile material close to a loudspeaker emitting sounds of water running, they only do so after a considerable period of time. Additionally the beavers, when faced with a pipe allowing water to pass through their dam, eventually stopped the flow of water by plugging the pipe with mud and sticks. The beavers were observed to do this even when the pipe extended several meters upstream and near the bottom of the stream and thus produced no sound of running water. Beavers normally repair damage to the dam and build it higher as long as the sound continues. However, in times of high water, they often allow spillways in the dam to flow freely. Beaver dams can be disruptive; the flooding can cause extensive property damage, and when the flooding occurs next to a railroad roadbed, it can cause derailments by washing-out the tracks, or when a beaver dam bursts and the resulting flash flood overwhelms a culvert. This disruption is not limited to human geography; beavers can destroy nesting habitat for endangered species, and often destroy mature trees for which they have no use. Introduced to an area without its natural predators, as in Tierra del Fuego, beavers have flooded thousands of acres of land and are considered a plague. One notable difference in Tierra del Fuego from most of North America is that the trees in Tierra del Fuego do not coppice as do willows, poplars, aspens, and other North American trees. Thus the "damage" by the beavers seems more severe. On the other hand, dam building can be beneficial in restoring wetlands. Such wetland benefits include flood control downstream, biodiversity (by providing habitat for many rare as well as common species), and water cleansing, both by the breakdown of toxins such as pesticides and the retention of silt by beaver dams. Over the eons, this collection of silt produces the rich bottom land so sought after by farmers. Beaver dams reduce erosion as well as decrease the turbidity that is a limiting factor for much aquatic life. While beavers can create damage, part of the problem is one of perception and time scale. Such damage as the undermining of a roadway or the drowning of some trees is very visible shortly after the beginning of beavers activity in an area. The benefits may be long-term and unnoticed except, for example, by someone monitoring a catchment. If a beaver pond becomes too shallow due to sediment accumulation, or if the tree supply is depleted, beavers will abandon the site. Eventually the dam will be breached and the water will drain out. The rich thick layer of silt, branches, and dead leaves behind the old dam is the ideal habitat for wetland species. Many may have been on the fringes of the pond. Wetlands have significant environmental benefits. A beaver dam has a certain amount of freeboard above the water level. When heavy rains occur, the pond fills up and the dam gradually releases the extra stored water. Often this is all that is necessary to reduce the height of the flood wave moving down the river, and will reduce or eliminate damage to human structures. Flood control is achieved in other ways as well. The surface of any stream intersects the surrounding water table. By raising the stream level, the gradient of the surface of the water table above the beaver dam is reduced, and water near the beaver dam flows more slowly into the stream. This further helps in reducing flood waves, and increases water flow when there is no rain. Beaver dams also smooth out water flow by increasing the area wetted by the stream. This allows more water to seep into the ground where its flow is slowed. This water eventually finds its way back to the stream. Rivers with beaver dams in their head waters have lower high water and higher low water levels. Beaver dams are a nursery for salmon. An early indication of this was seen following the 1818 agreement between the British government of Canada and the government of America allowing Americans access to the Columbia watershed. The Hudson's Bay Company, in a fit of pique sent word to its trappers to extirpate the fur-bearing animals in the area. The beaver was the first to go. Salmon runs fell precipitously in the following years even though, at that time, none of the factors were extant that we associate with the decline of salmon runs. The functions of beaver dams in increasing salmon runs are many. They provide deep enough water for the juvenile salmon to hide from predatory wading birds. They trap nutrients in their ecology and notably the huge nutrient pulse represented by the migration of the adult salmon upstream. These nutrients help feed the juveniles after they finish their yolk. They provide quiet water so that the young salmon can put energy into growth rather than into fighting currents and larger smolt with a food reserve have a better chance when they reach the sea. And beaver dams keep the water clear which favours all the salmonoids, trout included. The ponds created by well-maintained dams help isolate the beavers' home, their lodge, which is also created from severed branches and mud. The beavers cover their lodges late every autumn with fresh mud which freezes when the frost sets in. The mud becomes almost as hard as stone, so that neither wolves nor wolverines can get in. The lodge has underwater entrances to make entry nearly impossible for any other animal (however, muskrats have been seen living inside beaver lodges with the beavers who made it). A very small amount of the lodge is actually used as a living area. Contrary to popular belief, beavers actually dig out their den with an underwater entrance after they finish building the dam and lodge structure. There are typically two dens within the lodge, one for drying off after exiting the water, and another, drier one where the family actually lives. Their houses are formed of the same materials as the dams, with little order or regularity of structure, and seldom contain more than four old, and six or eight young beavers. Sometimes some of the larger houses have one or more partitions, but these are only posts of the main building left by the builders to support the roof, for the apartments have usually no communication with each other except by water. When the ice breaks up in spring they always leave their embankments, and rove about until a little before fall, when they return to their old habitations, and lay in their winter stock of wood. They seldom begin to repair the houses till the frost sets in, and never finish the outer coating till the cold becomes severe. When they erect a new habitation they fell the wood early in summer, but seldom begin building till towards the end of August.